Three students will receive the Graduate School’s fourth annual master's prizes, with Andrew S. Campbell to be recognized for academic accomplishment; Joyce Sunday for engaged citizenship and community service; and David Aaron for professional excellence. Campbell is a master’s student in History and an active U.S. Army Officer. He will be recognized for his complex thesis titled, Beware the “Hive of Presbytery”: The Scottish Presbyterian as Folk Devil in Restoration Britain. His project studies the stereotyping and stigmatization of Scottish Presbyterians in the reign of Charles II. Campbell went above and beyond requirements to take two full years of courses, in additional to writing his thesis. 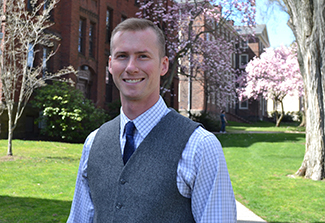 While at Brown he also worked with an NEH-funded program called Irregular Warfare: Experiences Across the Civil Military Divide, which facilitates the transition of student veterans to higher education and promotes dialogue between civil, military, and academic communities through humanities-based learning. This July Campbell will begin a new assignment as an instructor in the History Department at the United States Military Academy at West Point, New York. Sunday, a master’s student in Biotechnology, will be honored for her advocacy on behalf of international students at Brown. She has served on the International Student Advisory Board and the Graduate Student Council International Committee. 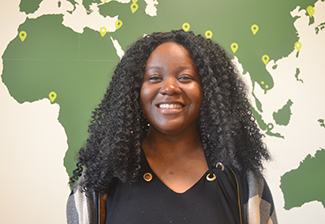 She was also the inaugural Graduate Fellow for the International Student Experience (ISE) Center and one of two Graduate Community Fellows for international students this past academic year. Through these roles Sunday planned and implemented new, innovative programming and also served as a mentor and advisor to incoming graduate international students. “Her commitment to the ISE team, and the international student community at large, has been unwavering throughout her past two years at Brown,” says her nominator and Program Director for International Student Experience, Christina Phillips. Her support of international students will be felt beyond this year, as she has helped to shape future events for graduate students surrounding orientation and year-long programming through the ISE Center and Community Fellows program. "I am really honored to have been selected for this award. All the work that I have done would not have been possible without the support and love from the ISE team. They have made my journey here at Brown a very memorable one," says Sunday. In addition to her efforts to support international students, Sunday, also gave time to other departments and organizations on campus. She served as a Sexual Health Awareness Group Peer Educator, as an Academic Coach through Academic Support Services, and worked with the University Advancement Student Call Center. She participated in the Women’s Entrepreneurship Organization and in the Summer Breakthrough Lab program with the Nelson Center for Entrepreneurship. She is also co-founder of a healthy snack company, Che! snacks. David Aaron is part of the first cohort of Executive Master in Cybersecurity (EMCS) students, a program through the School of Professional Studies. Like many of his classmates, David is a seasoned professional who sought out EMCS as a way to expand his already considerable expertise. As a federal prosecutor in the U.S. Department of Justice National Security Division, he primarily handles cases involving violations of the Espionage Act and Economic Espionage Act, as well as malicious cyber activity related to national security. David has particular expertise in the acquisition and use of electronic and online evidence and other legal authorities regarding government action in cyberspace. Read more about his award and accomplishments from the School of Professional Studies and Computer Science. Shayna Kessel, Associate Dean of Master’s Education, will present the awards at the Graduate School’s Master’s Commencement Ceremony on Sunday, May 27, at 10:30 am on Pembroke Field.